Definition: In basic terms a horse or pony with Azoturia has severe muscle cramps. Traditionally Azoturia was known as "Monday Morning Disease" as it would occur in working horses following a day's rest on Sunday. Azoturia is also known as "tying up" - especially in racing circles. The cramping usually occurs in the muscles of the horse's hindquarters and the back - causing stiffness and pain. The pain may be severe enough to cause sweating and laboured breathing. The stiffness may be so severe that it prevents the horse from moving at all. In exceptional circumstances the horse may go down and be unable to get up. The onset of these signs of azoturia are always associated, in some way, with exercise. 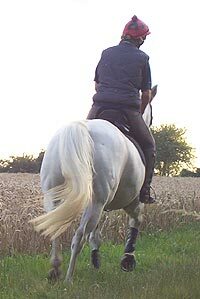 Classically an episode of azoturia will happen while a horse or pony is being ridden - the horse will become increasingly reluctant to go forward and the rider will become aware of increasing stiffness in the hind legs. The hind leg stride will become shorter and shorter. By this stage most horse riders will have dismounted. Careful examination of the horse will reveal that the muscles in the quarters and hind legs are hard, and usually painful, when pressed. Some horses may show signs of pain which may be confused with colic - pawing the ground, sweating, turning round to look at the flanks and perhaps going down on to the ground. At this point a rider may be tempted to walk the horse in hand in order to relieve the apparent colic - this is a grave mistake. In a case of azoturia any further exercise will make the condition worse and increase the chance of muscle damage. Veterinary attention should be sought immediately! Keep your horse warm until veterinary help arrives. If the horse is close to a stable it can be be very slowly moved to the box, rugged up, and left until the vet arrives. If the azoturia has occurred out on a hack, miles from anywhere, try to keep the horse in the same place and arrange to bring transport to the horse for the journey home. Better still call the vet to the horse where it is - but still arrange for transport back to the stable yard. Azoturia is most likely to occur soon after exercise begins - but is not the only way the problem will occur. Another variety of this equine muscle cramping occurs at the end of very strenuous exercise such as racing. A third variety of azoturia appears in horses that perform relatively low exertion exercise over a long period - such as long distance competitions or endurance rides. What causes Azoturia in a Horse or Pony? The cramping and pain are a result of changes in the chemistry of the fluids within the muscle tissues. As a result of these changes abnormal contractions of the muscle fibres occur and degeneration of of the tissues takes place. The underlying causes of this upset in the muscle chemistry may be obscure. The classical form of azoturia is often associated with resting the horse on full feed rations - hence the name "Monday Morning Disease" as it used to most often occur after a days rest on a Sunday. It seems that that at rest some overfed horses build up too great a store of carbohydrate in their muscles. When the horse begins work this carbohydrate is mobilised and causes changes in the acid base balance of the tissues. Even with perfect stable management some horse still succumb to azoturia - in these cases there may be other imbalances. Other cases of azoturia occur in horses with a thyroid imbalance, while others seems to be associated with an upset in the ration of calcium to phosphorus in the system. Other factors may also be implicated as some cases seem to respond to increased levels of selenium and vitamin E - even though there may be no actual evidence of deficiency when blood levels are assessed. The treatment of a horse that has suffered an attack of azoturia will include rest. painkillers and anti-inflammatory drugs. Affected horses will benefit from hot towelling of the affected muscles, heat lamps, or thermal blankets. A horse that has had an attack of azoturia will usually require a period of rest according to the degree of muscle damage. In addition supplements of minerals and vitamins may be added to the feed to avoid a recurrence of azoturia . The feeding and management of horses susceptible to Azoturia or tying up is crucial. Each case will need expert advice from a veterinary surgeon based upon the results of biochemical analyses.